After a couple of years of minimal output, Thom Yorke’s Atoms for Peace is suddenly the gift that keeps giving. Last week, we learned the details of their upcoming debut album, Amok, and then discovered that the band had hidden a choice Easter egg inside of the mural-like artwork found on their website. As it now turns out, that image actually does exist as a mural, and it moves just like the one on the web — well, more or less. 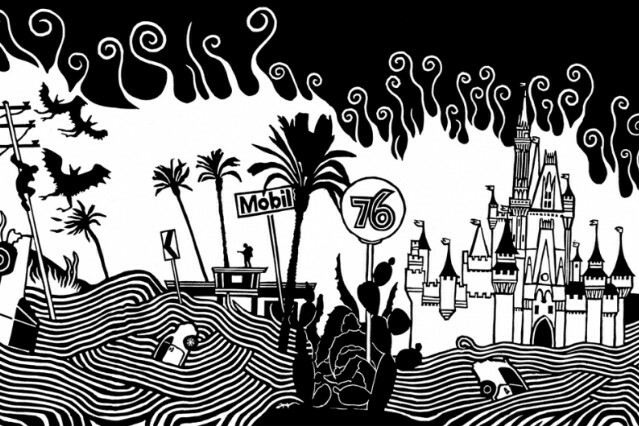 Atoms for Peace visual master Stanley Donwood collaborated with UK “GIF-itti” artist INSA to create “Hollywood Doom,” an installation in installments. INSA painted the Amok album art onto XL Recordings’ Los Angeles office, and then repainted the moving bits a handful of times in order to bring the thing to life via time-lapse photography. The end result is a brick-and-mortar mural, which also exists as an awesome GIF. Actually, several. “Los Angeles is, of course, fucked. Everything is fucked, all of our cities, all of our towns, our villages, our farms, our entire way of living. and I don’t mean fucked in a good way, oh no; I mean it in a very, very bad way. Our energy rich and culturally complacent society has doomed everything, and really, we all know this. Or at least, we should do. We have run out of everything, pissed it up against the wall, blown it, spent it, wasted it. We’ve run out of money, of oil, of gasoline, of water, of food, of any resources, of energy, of everything. We are reduced to trying to blast pathetic amounts of gas from solid rock and we don’t care if we poison our water while we’re doing it.